This game has been made in 48 hour for the GMTK Game Jam. Timer = Kill the player at 00:00 and give score at the end. Shoot = Fire an instant invisible beam in the direction of the cursor and reload weapon (0.4s). Hit blue round = Remove 1s to the timer, tp the player to the cursor position and instant reload. 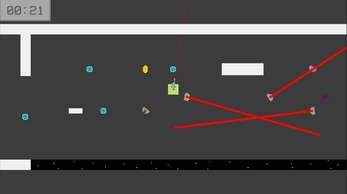 Hit enemy = Kill it, add 1s to the timer, tp the player to the cursor position and instant reload. Coins = Add a challenge for those who wants and it give score at the end. Powerups = Help you in the current run and add 5s to the timer.